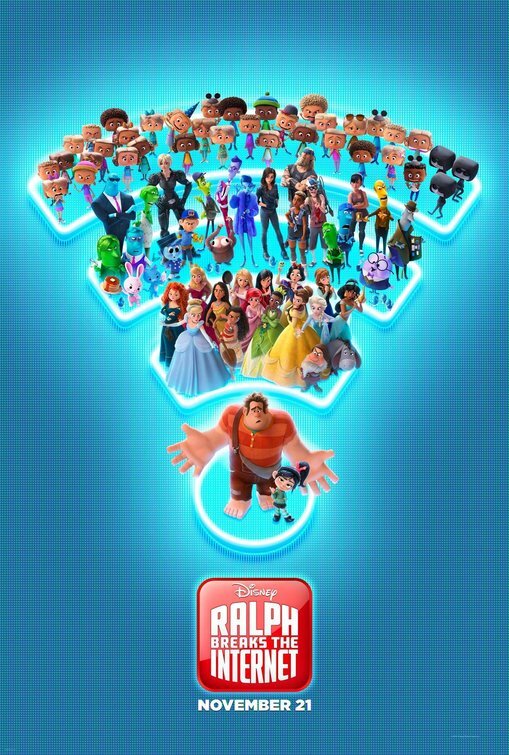 Synopsis: Six years after the events of “Wreck-It Ralph”, Ralph and Vanellope, now friends, discover a wi-fi router in their arcade, leading them into a new adventure. Review: I have to be honest and say that I wasn’t a ride or die fan of Wreck-It-Ralph when it first was released. It took me a while to find my way to the movie in theaters and though as a child of the ‘80s I appreciated the nostalgia its 8-bit arcade game lead character stirred within me it doesn’t sit high on my list of favorite Disney films. Though the sequel was hotly anticipated I didn’t even take the time to re-watch the original before taking in this colorful follow-up that I wound up having fun at. This one seemed to push the envelope more than its predecessor and was stuffed with enough rapid fire jokes to keep your head spinning. There are a plethora of Easter eggs to be found, especially for those that remember the early days of the World Wide Web and recall the way you would hold your breath when AOL would attempt to connect. John C. Reilly (Holmes & Watson) and Sarah Silverman (A Millon Ways to Die in the West) are back to voice our two lead characters with Gal Gadot (Wonder Woman) joining the cast as an ally to Silverman’s character. I also got a huge kick out of two scenes featuring every Disney princess that has appeared on film, most voiced by the same women that originally brought them to life. Slyly commenting on their storybook lives in this #TimesUp brave new world we’re living in, they were the highlight of the film. While the animation is wonderfully eye-popping I don’t feel the movie sticks in your brain like the best of the Disney animated films do. 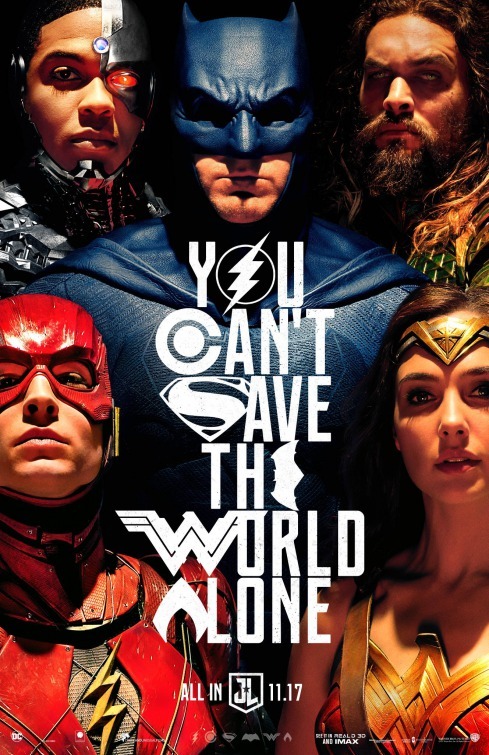 Synopsis: Earth’s greatest heroes are assembled to form the Justice League, to combat a threat beyond each member’s capabilities. Review: With the rousing success of Wonder Woman this summer, you had high(er) hopes for Justice League too, didn’t you? After the gloominess of Man of Steel, the critical drubbing lobbed at Batman v. Superman: Dawn of Justice, and the just plain awful debut of the Suicide Squad, the first solo outing of the Amazon princess made a huge splash with a snazzy film that signaled the floundering DC Universe might be getting back on track. Alas, it was not meant to be because five short months later Justice League arrives with a huge thud, halting any momentum Wonder Woman had kicked off. The problems are evident from the beginning. It should be noted that original director Zack Snyder had to be replaced shortly after filming ended while the movie was in post-production due to a family crisis. Joss Whedon (The Avengers) was brought it to touch up the script, and handle reshoots. Huge mistake. Whedon did good work with his involvement in the Marvel Universe but his humor doesn’t translate to the DC world that’s far darker and leaves itself less open for flights of fancy. His attempts to inject jokey humor crash and burn, especially seeing that they are awkwardly inserted into sequences already filmed by Snyder. Another elephant in the room to discuss is Henry Cavill (The Man from U.N.C.L.E. ), or, more to the point, Cavill’s mustache. After wrapping his scenes for Justice League, Cavill had grown a mustache to film a role in the next Mission: Impossible film and when he was called back for reshoots Paramount wouldn’t allow him to shave it. So he filmed his new scenes with facial hair that was then digitally removed…badly. Cavill comes off looking like a creepy puppet, with the bottom half of his face strangely not in communion with the upper. He’s in the first shot of the movie and it’s a jarring image that sets the tone for the rest of this schizo outing. The first half of the film is occupied by a bewildering series of episodic vignettes where we meet characters that the movie treats us as if we already know but in reality have never seen before. We’re plopped right into the stories of Aquaman (Jason Momoa), The Flash (Ezra Miller, The Perks of Being a Wallflower), and Cyborg (Ray Fisher) without much in the way of introduction or origin, almost like these were clips from a previous entry that was never released. We’re supposed to know and care about these characters instantly, but their arrivals are treated with such little fanfare it’s hard to warm up to any of them. Miller winds up being the most intriguing; his loner character is secretly desperate for friends and is brought into the fold by Batman (Ben Affleck, Gone Girl, checking out so much I can see why he’s trying to get excused from The Batman, a planned solo shot for the Caped Crusader) and Wonder Woman (Gal Gadot, Keeping Up with the Joneses). What I always enjoyed about the previous incarnations of Batman and Superman was how they were up against villains that seemed somewhat plausible…at least for a comic-book foe. From the Penguin to Lex Luthor, the heroes were battling adversaries that sought awesome power, not ones that already had other-worldly talents. The villain in Justice League is Steppenwolf, a poorly rendered CGI baddie voiced by Ciarán Hinds (Frozen) that’s as generic as they come. This is a bad guy that might have worked better as a Marvel rival but definitely not one the Justice League should be working to thwart. Steppenwolf is on the hunt for three Mother Boxes that form a trinity that can, snooze, give him power over all earth. Yawn, boring, wake me when it’s over. Poor Wonder Woman. That’s what I kept thinking throughout Justice League. 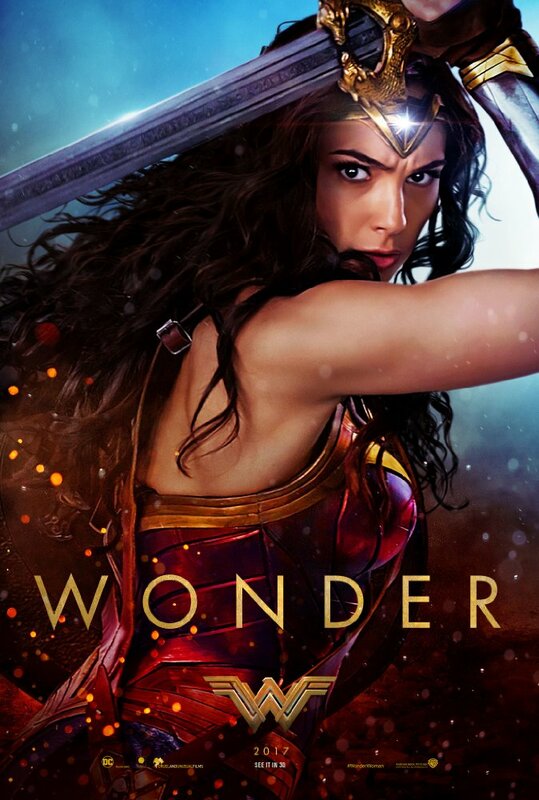 Gadot looks miserable having to carry this film, it’s clear the plot was tweaked at some point to give her character more to do and capitalize on the success of Wonder Woman. Her ascension to co-lead comes at the sacrifice of a bunch of familiar faces that get sidelined. Diane Lane (Inside Out) and Connie Nielsen pop up in brief cameos as the mothers of Superman and Wonder Woman, J.K. Simmons (The Snowman) doesn’t even have to glue down his toupee, and Amy Adams (Her) wears multiple bad wigs but does get the most unintentionally funny line of dialogue in the film: “I’m no longer Lois Lane, dedicated reporter”. 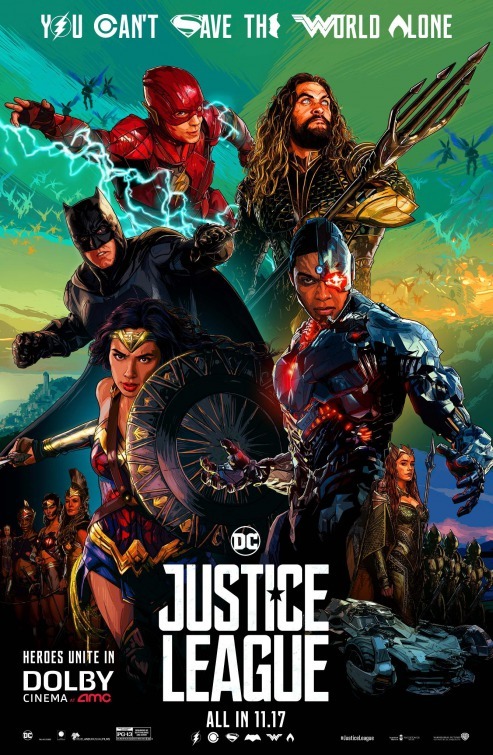 The effects of the hand-off between Snyder and Whedon really sink the film in its last ¼, when the Justice League works together to stave off Steppenwolf before he can unite the Mother Boxes. There are a few decent action sequences but they’re so darkly lit it all becomes a blur, especially when you add in Steppenwolf’s drone warriors that fly around in a head-spinning frenzy like wasps. It’s a blessing the movie is as short as it is, but it still feels pretty long when the content is as forgettable as this. You keep wanting to find something, anything to root for but no one seems interested in being memorable in any way shape or form. It’s like everyone was forced into making this and are waiting for their final scene to be shot. There’s a post-credit scene that does nothing to get you excited for the future, it feels like it was shot last week with the actors involved under duress. Based on his performance here, I shudder to think about Momoa’s Aquaman film coming in 2018, wish that Wonder Woman 2 wasn’t two years away, and am intrigued at a chance to get more info on The Flash in 2020’s Flashpoint. At this point, whatever the creative team behind these DC films are doing, it’s not working. Not only do audiences deserve better, but so do the actors locked into contracts for future films. Synopsis: Fueled by his restored faith in humanity and inspired by Superman’s selfless act, Bruce Wayne enlists the help of his newfound ally, Diana Prince, to face an even greater enemy. 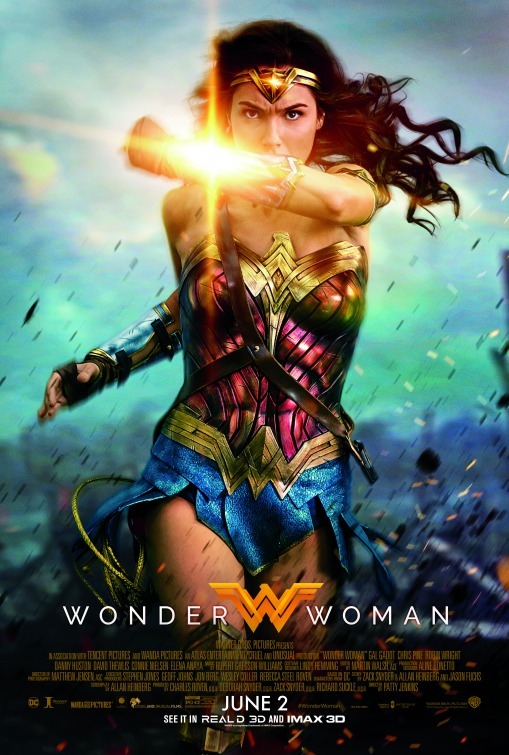 Thoughts: With Wonder Woman becoming the top-earning movie at the summer box office, the producers behind the DC Comics franchise are riding a wave of positivity right now. Let’s hope they can keep that goodwill going strong as the November release of Justice League draws near. 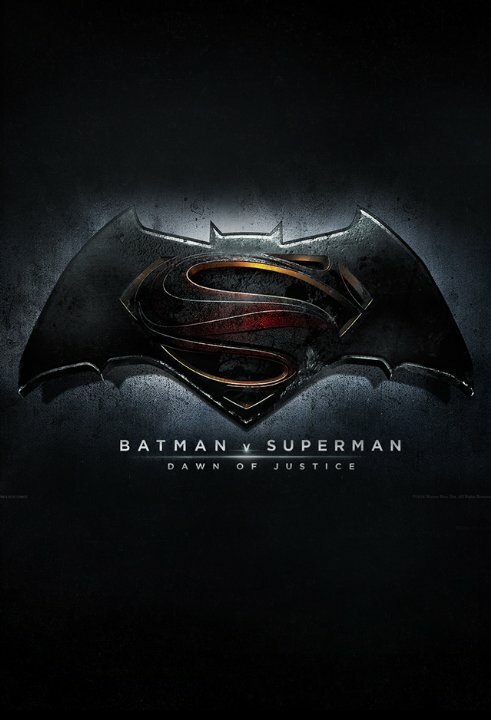 I didn’t mind Batman vs. Superman: Dawn of Justice nearly as much as my colleagues did but the unrelenting darkness of this franchise has kept it from truly taking off. Wonder Woman was a nice reminder of what these films could be while director Zac Snyder deals with a family tragedy, Avengers mastermind Joss Whedon was brought in to oversee postproduction so I’m hoping Whedon can bring a little Marvel spark to the DC Universe. This extended look at Justice League gives a few more clues for audiences to decipher and one cliffhanger that already has the internet abuzz. Synopsis: A suburban couple becomes embroiled in an international espionage plot when they discover that their seemingly perfect new neighbors are government spies. Review: When asked by a friend about my thoughts after screening Keeping Up with the Joneses, all I could offer up was, “It’s stupid. Not bad, not unwatchable…just stupid.” If you’re ok with ‘stupid’ then by all means get thee to your local theater and plunk down those bucks to see a movie that gets it wrong from the get-go. The problem is, I feel, with the cast. Not that Zach Galifianakis (Muppets Most Wanted), Jon Hamm (Million Dollar Arm), Isla Fisher (Now You See Me), & Gal Gadot (Triple 9) are wrong for the movie…they’re just in the wrong roles. Stick with me here, ok? How many times have we seen movies where statuesque women and movie-star handsome men play secret agents in disguise? And in how many features do they have sidekicks that aren’t quite runway ready but are more than capable of carrying lighter material? That’s the problem…all four actors above the title in Keeping Up with the Joneses are simply playing into expectations dictated by their Q-scores. I think I would have enjoyed the movie more had Galifianakis and Fisher swapped roles with Hamm and Gadot because it would have afforded them (and audiences) a chance for something different. Hamm could certainly have handled the comic bits and I think Galifianakis would have been able to smooth out some of the roughly scripted staid edges screenwriter Michael LeSieur couldn’t do himself. And why couldn’t Fisher have been the confident super-spy that shows repressed suburban mom Gadot how to wear French cut lingerie and trade bullets with bad guys? 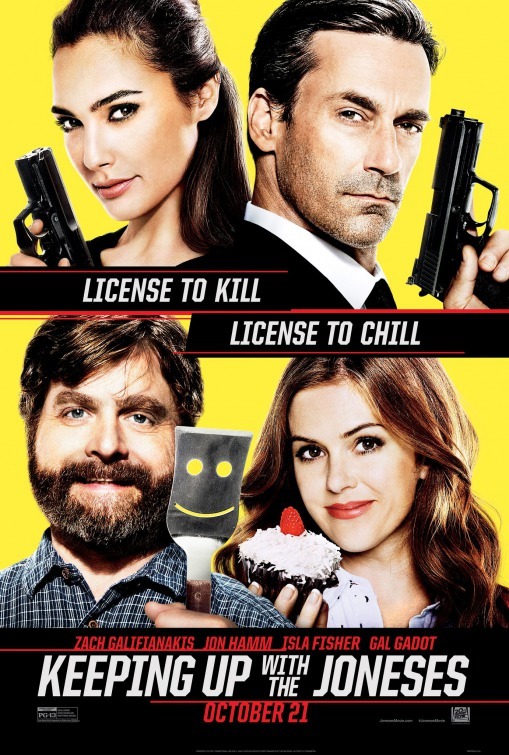 Sadly, no one asked my opinion so Keeping Up with the Joneses is just your standard spy comedy where everyone is simply coasting along to pick up their paycheck at the end of the week. There’s little joy in the telling of the tale where government operatives Gadot and Hamm pose as new neighbors in a cul-de-sac populated by the employees of a local software business. Galifianakis is the HR rep for the company and Fisher is his homemaker wife that’s the first to notice the new couple on the block is too good to be true. When a mole offers to sell a valuable computer chip to the top bidder, the two couples become involved with a little espionage and a lot of poorly constructed action sequences. If there is a VIP of the movie, Fisher is certainly it. Possessing good comic instincts and a true talent for physical comedy, Fisher easily outperforms Hamm and Galifianakis, both of whom barely lift a finger to bring anything new to the party. I wish Gadot’s role wasn’t quite so one-dimensional, though her role-reversal of power with her seemingly more macho counterpart is a nice wrinkle. The supporting players are a collection of desperate scene stealers clearly compensated with free meals from their scenery chewing. For all its brightly lit suburban bliss and basic cable action scenes, director Greg Mottola’s (Superbad) film looks pretty cheap. I expected some of the sets to tip over if people leaned against them and the few special effects would have been impressive had this come out the summer after Tron did. Keep your eyes open for a scene between Galifianakis and Hamm that was clearly a reshoot – both men are wearing wigs so fake looking you’d swear they raided the discount Halloween bin at CVS. Possibly enjoyed as a rental down the line, Keeping Up with the Joneses isn’t worth much of an effort this fall. Synopsis: A gang of criminals and corrupt cops plan the murder of a police officer in order to pull off their biggest heist yet across town. Review: Triple 9 kinda snuck up on me. Admittedly, I’ve been a little distracted with the upcoming Oscars to prep for and an aversion to perusing trailers that give too much of the movie away. Still, I was surprised that a movie boasting the A-List talents that Triple 9 has didn’t register on my radar until it’s release date was already rapidly approaching. We’ve emerged out of the murkiness of a dull January and are entering into the warmer waters of February and while Triple 9 isn’t the best work of anyone involved, it’s a solid entry into the crime drama family. Presented with the right amount of grit, grime, and gore (one bloody scene takes place in a dilapidated housing project infested with vermin both human and animal), the movie takes a solid 45 minutes to get going into any interesting direction. First it’s a heist film, then a cop drama, then it’s (briefly) a buddy picture before settling into its tale of corruption and double crosses. All of it seems a bit recycled from better pictures but I kept going back to the fact that it’s quite well made and earnestly performed by its impressive roster of bad guys and gals. The film opens with a bank robbery executed with tactical precision led by small time criminal Michael Atwood (Chiwitel Ejiofor, Secret in Their Eyes). On a mission to obtain the contents of a security deposit box that’s set to net him and his crew a tidy sum upon delivery, Atwood has more than money on his mind as his payday is being funded by his son’s mother’s sister (did you follow that? ), the acting head of a Russian mafia family. When the boss lady (a smirking Kate Winslet, Labor Day) demands Atwood and his crew take on one more mission, it comes with hefty consequences for all involved. Into the mix is thrown Chris Allen (Casey Affleck, The Finest Hours) a cop returning to duty in a new precinct. The new kid on the block steps on some toes, including that of his grumpy partner (Anthony Mackie, Pain & Gain) and the local gangbangers who are used to cops looking the other way. How Chris becomes linked to Atwood is one of the twists you’ll have to experience for yourself but no double cross comes as a surprise and no one is safe from the chopping block as one major character learns early on. Look, there’s some good stuff to be found here, such as director John Hillcoat’s (Lawless) staging of several tense chase scenes and shoot-em-ups. Hillcoat is solid at ratcheting up the stress meter of the actors and the audience as we peer around dark corners not knowing what we’ll find. We’re all let down by Matt Cook’s script, a mish mash of underdeveloped characters and a final feeling that the whole dirty business was pretty pointless. As you can see from the poster above and nearly all the marketing materials, red is the color du jour and Hillocat goes a little overboard with the red herrings and red visuals (smoke, clothes, signs, lighting, etc) to the point where you just want to say “OK, we get it…it’s symbolic.” and move on. Ejiofor seems a little sleepy here, only coming alive in scenes where he’s going toe to toe with Winslet. 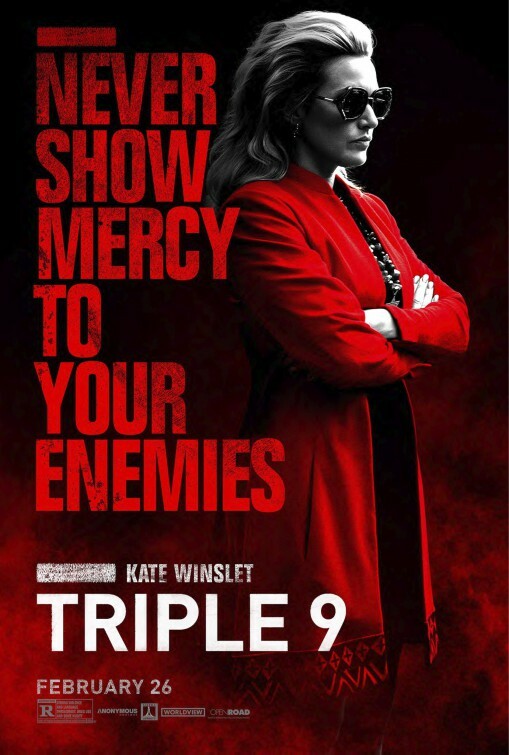 Winslet, for her part, is to be commended for trying out another bad girl (after her swing and a miss with Divergent) but it just doesn’t suit her…kinda like her iffy Russian accent. Winslet’s actually in more of the movie than I thought she’d be, but it’s reduced to a series of scenes where she taunts Atwood that she can whisk his son away at any moment. Aaron Paul (Need for Speed), Clifton Collins Jr. (Pacific Rim), Teresa Palmer (The Choice), and Gal Gadot (Fast & Furious 6) comprise the rest of the cast and, especially where the women are concerned, fade to the background faster than they should. Let’s not forget Woody Harrelson’s (Out of the Furnace) half serious/half jokey performance as a veteran detective, the uncle to Affleck’s character. Seeming to be impersonating his True Detective co-star Matthew McConnaughey’s laid back twang and sporting a confusing set of false teeth, Harrelson adds some spark to the film…but at what some significant cost to his overall effectiveness. It’s a rather mulligan stew of a picture and it’s too long by a good twenty minutes, but Triple 9 isn’t a totally unwelcome guest. Might be worth a lazy matinee day but it could easily wait to take up your time at home. Thoughts: As I mentioned in my review of the first teaser for Batman v Superman: Dawn of Justice I wasn’t a huge fan of Man of Steel and was pretty reticent that we needed another Batman entry so soon after Christopher Nolan’s quite satisfying trilogy wrapped up. 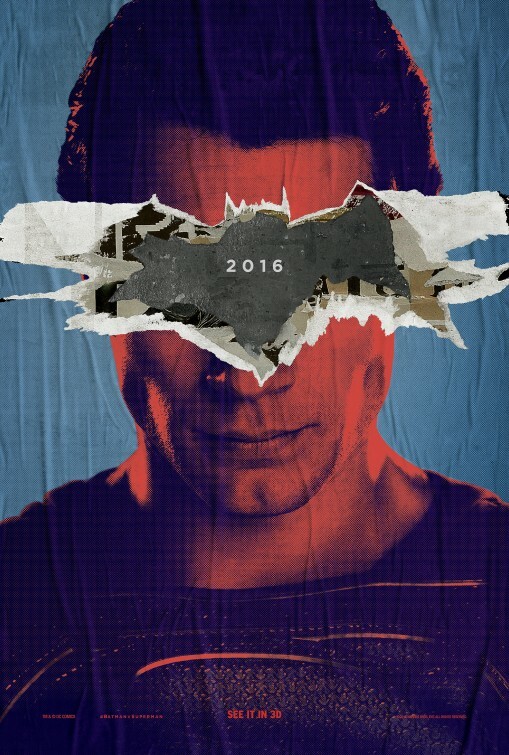 Well, an extended trailer released at the 2015 Comic-Con convention in San Diego has got my attention and while I’m still iffy on this sequel to a sub-par Superman reboot there’s a growing kernel of anticipation for this one that I can’t totally ignore. Like the recent preview for Suicide Squad, I was a little taken aback that the trailer was so long but while it shows audiences what they can expect from the March 2016 release, thankfully not every plot development has been laid out for us. Give it a look…I think, like me, you’ll like what you see. Synopsis: On the heels of the worldwide success of Man of Steel director Zack Snyder is bringing together the two greatest Super Heroes of all time – Batman and Superman for the first time on the big screen. Thoughts: I still think 1979’s Superman: The Movie is one of the best all around “comic-book” origin movies to be made and I was more than willing to give director Zack Snyder’s reboot a fair chance. After all, look what Christopher Nolan did with his reinvention of Batman in three films about the caped crusader. Sadly, Superman’s return in 2013 was a glum bummer, and a movie that took way too long to come out (how can a new Star Wars movie be filmed and come out in a little over a year but Snyder takes almost three years for his meal to cook?). Disappointments aside, the film made good on its franchise starter nature at the box office yet it’s a little surprising that Warner Brothers decided that the sequel should merge its flying superhero with The Dark Knight – the poor guy was enjoying a well-deserved retirement. Feeling the heat from Marvel’s unstoppable films, I’m sure that DC Comics was more than happy to bring their Justice League dreams to light…why else would this Superman sequel feature not only the Man of Steel and Batman but Wonder Woman and Aquaman as well? I hope the film isn’t merely a bridge to a bigger idea, but from the looks of this impressive teaser Snyder may be borrowing a page from Nolan and going ultra-dark. 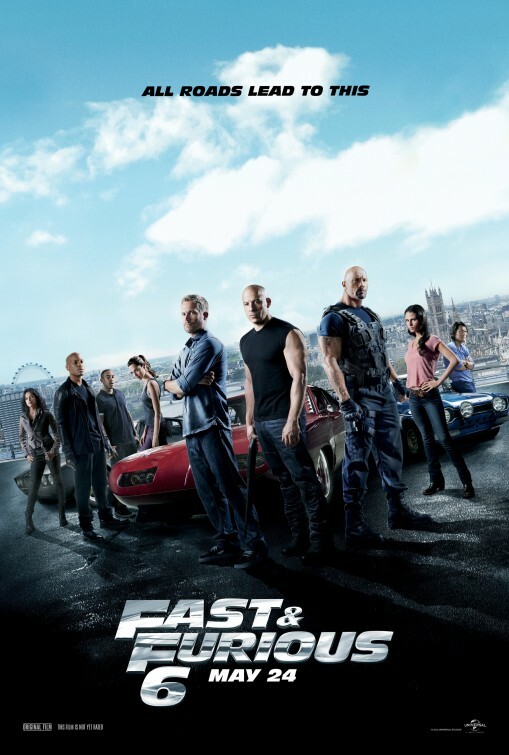 Synopsis: Hobbs has Dom and Brian reassemble their crew in order to take down a mastermind who commands an organization of mercenary drivers across 12 countries. Review: Big. Dumb. Fun. These three words describe not only Fast & Furious 6 (or is it Furious 6 as the title credits suggest?) but also its star. Though the film franchise has had its occasional bumps in the road, the movie owes much of its successful entries to Vin Diesel (Riddick), a modesty decent actor that is at least smart enough to know his limitations. Coming off a surprisingly impressive fifth entry that showed there’s more than a little gas left in the tank, the sixth chapter keeps things speeding along so fast that the plot holes and implausible stunts just appear as roadside distractions on the way to your final destination. That’s mostly thanks to Diesel and director Justin Lin who returns for his fourth film in the director seat. By this point, Lin is old hat at highlighting the best assets of a muscled cast while still giving the audience what it came for – high octane action sequences that provide lots of popcorn entertainment. This globe-hopping film brings back many of the characters from previous entries…being somewhat familiar with the series will benefit any viewer so you’re able to keep things straight. In fact, there’s someone from each of the preceding films that play a part here so the more you know who is who the better…especially for the post-credits scene that hints at where the seventh film (coming Summer 2014) is headed. Wait…I’m getting ahead of myself here. Furious 6 takes the characters in a slightly different direction as Diesel and his crew team up with the federal agent (Dwayne Johnson, Pain & Gain, Journey 2: The Mysterious Island) that was after them in Fast Five. Why do they join forces you may ask? Well (spoiler alert) it seems that Diesel’s girlfriend Letty (Michelle Rodriguez), who seemed to meet her end at the beginning of #4 is alive and well with a case of amnesia. She’s working for the bad guys though (headed by Luke Evans, The Raven) that are out to steal a top secret government weapon. That’s really all you need to know before heading into the film because after that basic set-up it’s primarily just a lot of well-staged action sequences that lead up to a ear-splitting finale involving a helluva lot of cars and one large airplane on what seems to be the longest runway in the history of modern cinema. These films have a proven formula that’s rarely deviated from…which isn’t necessarily a bad thing because with each entry there’s a strange sense of refreshment from all involved. While some franchises can’t even spit out three films (see The Hangover III) the Fast and Furious flicks are doing well at #6 and looking forward to a seventh entry that’s already in pre-production. Back in the day I wouldn’t have attributed the success to Diesel and company but after sitting through this decidedly good natured film I must give credit where it’s due. True, there should be a drop box as you enter the theater where you can deposit your brain and sense of logic but isn’t that what some of the more fun summer movies are all about? Don’t think too much about the stunts that would break the backs of everyday men and women but bask in the joy of seeing the stunts executed so realistically. Though it seems this entry has less car action than in the past, there’s some ingenious stunt work done when it comes time to rev those engines. Franchise fans are in for a treat with this entry that isn’t quite as good as the last film but still makes a strong impression for those that have followed the series for the better part of a decade. One note…make sure you remember that #3 (Fast and the Furious: Tokyo Drift) takes place AFTER the events of this film…you’ll enjoy the final tag more.